Dr. Samir Parikh delivered a key-note address on "Smoking in School Aged Children: Steps Towards Prevention" as a part of the National Consultation on Tobacco Use held at Fortis Memorial Research Institute, Gurgaon. 9 corporate seminars were conducted by members of the department at corporate organizations on "Quit Smoking". The "Let's Send Hugs" campaign was launched on 31st May. This Facebook application allowed users to send HUGS (Have you given up smoking?) to their friends to encourage them to quit smoking. This application was accompanied by information on the dangers of smoking and tips on how to quit smoking. Week-long tips were shared on Facebook and Twitter. 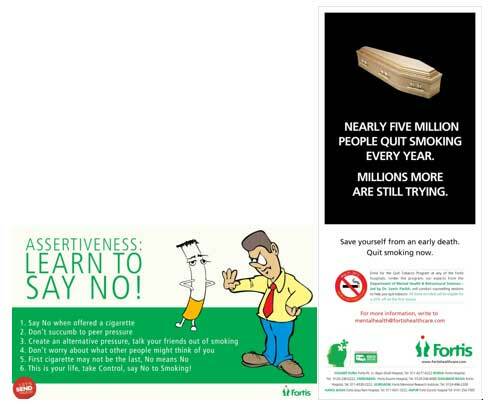 Blogs were uploaded on the Fortis Healthcare website that talked about the various aspects of tobacco use and smoking. A survey to understand the parameters associated with initiation and quitting of smoking amongst young adults was conducted across select corporates in the Delhi-NCR region. The results and recommendations of the survey were shared with the participating corporates. Results of this survey received front page coverage in Hindustan Times. Displays were placed at the Fortis Hospitals in Delhi-NCR, Mumbai and Kolkata.